For Billy Wieczorek ’11, the march represented a unifying factor that the campus had been missing. “I really feel, especially in the last couple of years, there’s been a lot of stuff where certain people have been upset, but nothing that’s really energized the entire campus,” he said. 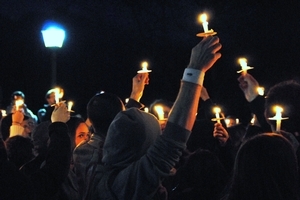 The march culminated outside of KJ before the film screening with hundreds of students holding candles singing “Amazing Grace.” When the march started to disperse, Michael Bethany ’11 stood and gave an unannounced speech encouraging community members to respect each other in the face of hate. Ramsdell’s film analyzes how people can find tolerance and peace amidst a world populated with hate groups and hate crimes. The screening was planned far in advance of any of this year’s reported bias incidents, but Ramsdell felt it was appropriate to open dialogue encouraging tolerance and acceptance. “The film never set out to say these are answers, but it certainly set out to say this is a place to start,” he said. The march could have had a dramatically different feeling if the Westboro Baptist Church (WBC), a hate group which has made headlines (and a Supreme Court case) for protesting homosexuality at military funerals, had protested the film’s screening at Hamilton, as their picket schedule indicated they would. Campus Safety set aside a cordoned-off area for protesters to picket, but no one appeared to publicly oppose the film or the march. A separate counter-protest to the WBC was organized, but many people chose to use the march as a counter-protest. 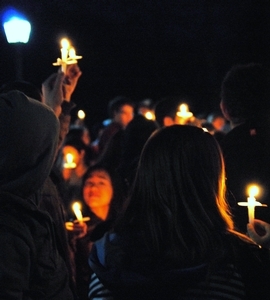 “A lot of people thought it would be better to ignore them [in case they showed up], but I thought it couldn’t go unbalanced without a show of love and peace,” said Becca Ross ’14. Tarnate was pleased with the turnout at the march, but attributed much of the attendence to people wanting to protest the WBC. “It’s unfortunate that we needed the threat of something so hateful to unify the campus and bring everyone out,” she said. 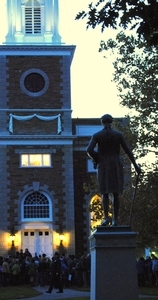 The march and movie screening are steps to increasing awareness and tolerance at Hamilton, but Rehman felt more is necessary. “I feel that all bias incidents in general unfortunately stem from ignorance and a lack of education, whether it be about a religion or specific issue or matter,” said Rehman. “I think awareness and knowledge are the key ingredients to decrease any fear that people may have and to just help others better understand an issue. We just want to help spread awareness about these types of bias incidents in hope that future ones will not occur.” To help her mission of decreasing fear and intolerance, Rehman extended an invitation for members of the Hamilton community to attend an MSA meeting or to contact her with questions.